Can a DVD recorder record Dolby Digital 5.1 or DTS surround sound? Can DVD Recorders Record Dolby or DTS Surround Sound? Using a DVD Recorder is one way to preserve video content for viewing later or sharing with friends and family. However, there are restrictions on what type of videos you can and cannot record. In addition to video recording restrictions, there are also some limitations on what type of audio you can record using a DVD recorder. Just like a DVD player, DVD Recorders can play back audio from commercial CDs and DVDs. This means that with DVD soundtracks, all DVD recorders can play back Dolby Digital 5.1 surround sound, and most can play back DVDs with DTS 5.1 soundtracks. This is done via digital optical/coaxial or HDMI outputs when used with a home theater receiver or other compatible audio systems. However, although DVD recorders can play back commercial DVDs with surround sound audio, when it comes to making your own DVDs, DVD recorders do not have the ability to record in the Dolby Digital/DTS 5.1 channel surround sound formats. The reason for this is more political than technical: Even if you are successful at making a copy of a DVD video, you are prevented from making a copy of the multi-channel soundtrack, thus limiting you from making an "exact" video and audio copy of a DVD on a DVD recorder that could be "passed off" as the original. Also, video recordings made from camcorders or VCRs don't have Dolby or DTS surround sound audio tracks, so the need for a DVD recorder to record surround sound is lessened further. As a result of the above audio recording restrictions, DVD recorders do not have the necessary audio inputs for recording surround sound. In order to record Dolby Digital/DTS 5.1 surround sound audio, the DVD recorder would need a digital optical, digital coaxial, or HDMI audio input, which is not provided. 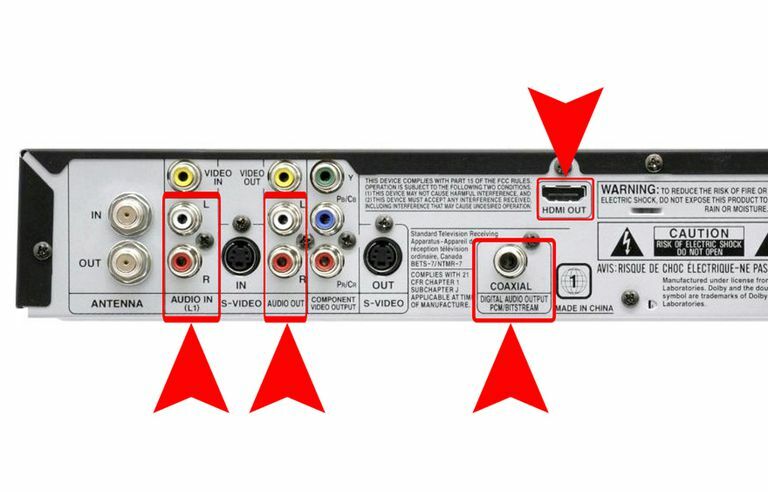 However, if you look at the rear connection panel of a typical DVD recorder, you will notice that while both analog and digital audio outputs are included for passing audio to a TV, home theater receiver, or soundbar for playback purposes, when it comes to recording audio from external sources. such as a DTV converter, DVD player, or VCR, only analog stereo audio inputs are provided. In addition, if the DVD recorder has a built-in DTV tuner, USB, or DV (aka IEEE-1394/Firewire) input for digital camcorders, audio can be recorded via those options as well, but not in surround sound. When audio is recorded using a DVD recorder, the incoming analog audio signal is encoded by the DVD recorder in Dolby Digital (DTS is not used in DVD recording) for placement on a DVD, but it is only done so in two-channel form (no surround sound). The output of the two-channel recorded audio can then be sent in analog form via the analog stereo outputs or in digital form via digital optical/coaxial, or HDMI outputs of the DVD recorder. Although DVD recorders cannot record in Dolby Digital or DTS 5.1 channel surround sound there is an indirect way to access surround sound from your DVD recordings when playing them back on the DVD recorder or any other DVD player. The way this is done is to take advantage of the audio processing features available in most home theater receivers. This adds another dimension to the audio recorded on your home videos. The way this works is that if the DVD recorder or DVD player playing the recorded disk is connected to a home theater receiver via any of the analog or digital audio output options, if that receiver provides Dolby Prologic II/IIx and/or DTS Neo:6, the two-channel audio recording can be expanded into a 5.1, 6.1, 7.1 channel sound field, without having been natively encoded. Although this solution does not provide as accurate a result as a native Dolby Digital or DTS 5.1 soundtrack source that has been decoded, it is definitely more immersive than two-channel stereo. There are also additional surround sound processing and enhancement options you may be able to take advantage of depending on your brand and model of home theater receiver that can expand a two-channel source into a more expansive surround sound listening experience. These include Dolby Pro-Logic IIz, Audyssey DSX, DTS Neo:X, DTS Virtual:X, and brand-specific DSP (Digital Sound Processing) formats, as well as presets offered on many receivers such as Concert Hall, Movie Theater, Arena, Stadium.